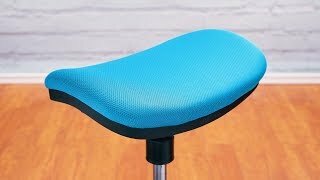 What's so ergonomic about the E3 Crescent Saddle Stool? The E3 is ergonomic because it lets you switch postures and move more frequently throughout the day. In ergonomics, moving more is the name of the game, and this stool lets you straddle or sit on the cushion and rock, tilt, or sway for more engaging movement while you work. Can I use the E3 at my standing desk? Yes! The E3 was designed for use at both height adjustable and fixed-height desks. Can I use this all day instead of my usual office chair? Although we know that the E3 is comfortable, most office stools are not designed for all-day use due to the fact that they do not offer back or lumbar support. Instead, we advise using this as a complementary seating option in addition to your full-time office chair. I'm tall - will this work for me? It depends on your exact height. Our designers made the E3 Crescent Saddle Stool for users from 5'1" up to 6'3", making it suitable for most of the population. Yes! This crescent-shaped plush seat supports your behind and gives you more freedom to switch up your posture, just by rotating it. Sit on the E3's seat in traditional or straddled positions, whatever you feel like in the moment. What kind of fabric is on the seat? The E3 is upholstered in soft and textured mesh fabric that provides for ideal airflow while adding a little more traction to help keep you on your seat while you perch. Is this different from the Motion Stool or the E7 Stool? Yes, you'll notice right away that our E3, E7, and Motion Stools feature different designs, and at first use you'll also probably be able to tell that both stools tilt in vastly different ways, too. The E3's elongated seat allows users to sit in two positions, which is a new feature that the E7 and Motion Stools don't have. It also comes with a pivot cap design, which allows the stool to tilt from under the seat and not from the base, like a lot of active stools. Need help deciding? If you want to sit on a stool that lets you move from side to side, pick the E3 Crescent Saddle Stool. To perch and tilt at more of an angle, our Motion Stool or E7 Stool might be the stool for you. Depending on their height, the E3 might work for some middle school and high school aged children with heights ranging from 5'1" to 6'3". However, is this is too tall for your child, we do have other kid-friendly stools that are designed with the height adjustment range to suit children from pre-k through 5th grade. You can shop all of our kids active stools here. Can I use this on carpet or hardwood? Absolutely. This stool is designed to use on hard and soft flooring, so that means hardwood, concrete, tile, and carpet are all acceptable surfaces. Pick from orange, turquoise, or green upholstered seats on your E3 Crescent Saddle Stool.